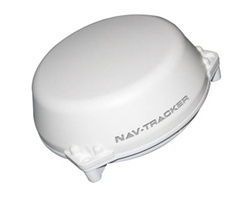 NAV-TRACKER is a self contained, "install-and-forget" Inmarsat Satellite based GPS tracking system. This system, consisting of an integrated Inmarsat/GPS antenna with 60ft antenna cable, receives its position reports from GPS Satellites, then relays this information over the Inmarsat Satellite Network to ground stations and to shore-based servers. The information is then available to the ship owner on any computer with an internet connection or as a daily email or SMS text message to a cell phone. When the system is armed/disarmed, goes into alarm or the Geo fence is breached, the system will automatically send up to 10 email and/or text message recipients a message notifying of the events on the vessel. 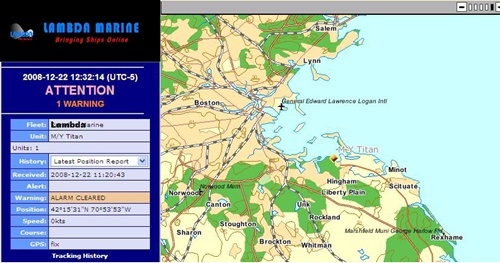 The NAV-TRACKER can be tracked and controlled remotely by the user/vessel owner from a 3rd generation tracker website. This allows owners to keep track of their vessels from anywhere in the world. Position report intervals can be selected from minimum once a day to a maximum of every 5 minutes, configurable by the user over the internet. depending on subscription. Will continue to send these reports every 2 to 30 minutes (user preference, can be set via a website and changed when in breach), until the vessel returns to its original geo-fence area or is disarmed (locally or on the website).